That is the McDonalds Coke Float, which is also known as McFloat. Just recently, Jollibee placed a new item on the Jollibee Menu and that is the Jollibee Float. A float is just a simple softdrink placed with a float, which could either be an ice cream or a sundae. I was surprised to see this new addition to the Jollibee Menu so me and my beloved tried it one time. Well, there is nothing special with Jollibee Float. It is just a coke with a sundae on top. 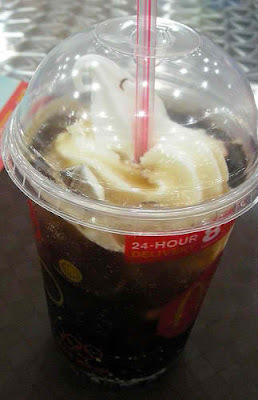 I believe that the McFloat tastes better than the Jollibee Float because their ice cream or sundae is better. I think that Jollibee will continue innovating the Jollibee Menu and they will improve the Jollibee Float. But as of now, if I am looking for a float, I would go to McDonalds. How about you? What do you think of the Jollibee Float? Visit Ahab Reviews and Tips and read about my top five most favorite items on the Jollibee Menu. I've tried that na pero mas type ko lasa ng Mcfloat! Teka. Sabihin ko sa may-ari ng Jollibee na magpatayo ng branch d'yan sa Palau. Ako rin Ate Anney. Parehas tayo. I prefer sundaes too. They taste better than floats. Not into floats. Prefer just ice cream or sundaes... McD's are nice. You are not into floats too like Bluedreamer. Well, yeah, I guess the reason for that is that Coke dilute the taste of sundae that's why that does not taste good to both of you. I have tasted the Jollibee float but the strawberry falovor, also i'm a Mcdo kid, loyal talaga ko sa kanila dahil sa happy meal nila simula nung bata pa ko, hahahahha. Ate Liza!!! Na-miss kita dito ah. Hope you are doing fine. Hindi ko pa nasubukan yung watermelon float ng Jollibee. My younger brother bought one and say that he doesn't like the watermelon float. Oh, well, it depends upon the person. request nman d ba kau mgkakaron ng jollibee sa japan....! You are very much welcome Nene.